laker2: Because I am no longer associated with Sugar Loaf, it will be impossible for me to maintain this cache. Thanks to the many of you who have visited it. 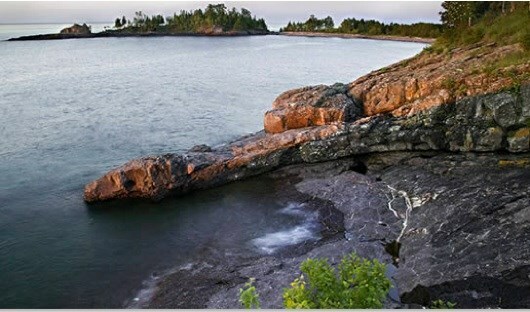 This multicache will introduce you to a truly magnificent and beautiful area along the North Shore of Lake Superior: Sugarloaf Cove. The indicated coordinates will bring you to the first cache and will also be the place at which you can park. Coordinates within the first cache will direct you to the second and so on. In all there are six caches, including the starting one. These caches are along a self-guided interpretative nature trail ("Loop Trail") and are either on the main tail or within 10 to 25 feet of the trail. This trail is restricted only to foot travel; NO MOTORIZED VEHICLES OR BICYCLES ARE ALLOWED. The total distance you will travel will be approximately 1.5 miles and may require up to an hour to find all six caches. There are many scenic sites along the trail; take time to enjoy the spectacular views. You will not be disappointed by your experience! From the 1940’s through the 1970’s, Sugarloaf Cove was used by Consolidated Papers, Inc. as a pulpwood landing—a place to collect logs before rafting them across Lake Superior to Ashland, Wisconsin. To do this, the paper company made many changes at the site. Low areas were filled and much of the forest was cut down so that logs could be stacked and buildings and roads could be constructed. When the paper company stopped using the site in the 1970’s, they removed most of the buildings and planted pine and spruce trees in some areas to cover the bare soil that was left behind. In other disturbed areas, plants began growing on their own. Many of these plants were exotic species, not the native plants that had originally grown at Sugarloaf Cove. This area is now in a state of active restoration as will be observed as you visit each of these caches. Vg vf nyjnlf orggre gb ybbx fgenvtug nurnq naq/be hc engure guna ng bar'f srrg.